As we all know, ISO image is easily burnt to DVD disc and transported through internet. But it's pity that so far no portable device supports this file, making ISO image poor for portability. So if you want to put ISO file to iPad for watching on the move, an ISO to iPad converter is absolutely indispensible. Here MacX DVD Ripper Pro works flawlessly everytime you opened it and empowers you to convert ISO to iPad supported format such as convert ISO to MP4, thus making your ISO files more mobile. Besides, by adding new profiles especially for the newly release iPad Mini, the professional-grade application also demonstrates a great ability to transfer ISO files to the new iPad Mini. Particularly, we provide two different versions for different users, so please choose the correct version: For Mac users, please download Mac version ISO to iPad converter; For Windows users, please download windows version ISO to iPad converter. Step 1: Load ISO image. free download and run this ISO to iPad converter on Mac, click "DVD ISO" button to import the ISO file on your Mac computer. Here you can directly choose "to iPad and Tab" as output video format. If you want to rip ISO to iPad Mini 4, you can choose "to iPad and Tab" and then select the proper profile setting from the tab below. What's more, this DVD ripper enables you to rip ISO to iPhone. It also boasts a flood of features and comes with a variety of options to make your DVD collection more mobile by ripping DVD to a wide range of formats for putting it on your mobile device like iPhone, iPad, iPod, Samsung, PSP, HTC, etc. Click the "RUN" button to begin the process of ISO to iPad/iPad Mini conversion. What sparkles your eyes when using this ISO to iPad converter also attributes to its unique DVD copy feature. The quality of copy it produces, specifically, pushes it into the top product because it creates a perfect 1:1 copy of the content. Finally, no matter you ripped ISO to iPad compatible or incompatibole formats, you can apply to MacX MediaTrans to transfer the DVD movies to iPad mini, iPad Pro, iPhone 7/7 Plus, iPhone SE, iPhone 6S/6S Plus/6/5 etc. Are you in search for a free DVD to iPad converter with no watermark or time limit? MacX Free DVD to iPad Ripper for Mac is the best freeware that converts DVD to iPad for free on Mac OS without any limitations. Still seeking for the best DVD ripper for iPad to make utmost out of your iPad? Well, this article will introduce top 3 best DVD to iPad converters for Mac that can rip and convert DVD to iPad (iPad Air 2, iPad Mini with Retina, iPad 4/3/2) accepted video format, so that you can watch DVD movies on iPad wherever you go. Pull a long face snoot for inability to import DVD to iPad Air? Take it easy, MacX DVD Ripper Pro brings you an ultimate solution to let you copy and rip encrypted DVD movies to iPad 5 Air via a few clicks. 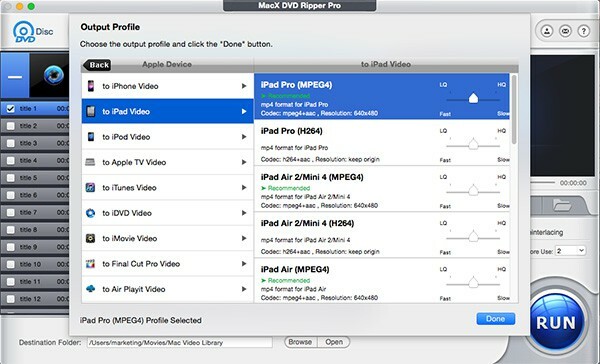 MacX DVD Ripper Pro is the best DVD to iPad ripper for Mac which can freely rip DVD to MP4, MOV, M4V iPad supported formats or iPad Pro/Air 2/mini 4 and backup any DVD disc, ISO image, DVD folder on Mac (MacBook Air/Pro, iMac etc) in 1:1 quality with original quality.